Microsoft Windows CE, available in CORE and PROFESSIONAL version. The complete Digitax Framework 4.1 allow the developers to create their applications and their services with the maximum simplicity and in very reduced time. A rich set of Sample Source Code is provided, along with extensive technical support. Automotive connectors designed specifically for use in automotive systems. External microSDHC socket accepts memories up to 32 GB. USB Client Port available for Development and ActiveSync connection, USB Host Port available for external peripherals such as USB Pen, USB Mouse, USB Keyboards, etc. TFT Colour Display with TouchScreen allow to develop easy accessible application interface. Automotive TouchScreen designed to satisfy Automotive specifications (automotive temperature range). High Brightness, Daylight readable display. Brightness can be control manually and programmatically. Dedicated sensor available for intelligent automatic back-light control. Avoid consumption and damage of Touch Screen for heavily used operations. An API is provided which allows to interface Hardware Keys with the user application. The power key is a Smart Power Button, completely programmable and used to perform several important tasks. Can be also disabled or programmed to trigger Ghost Mode (fake shutdown). The device can be powered with voltages ranging from 8 to 32 VDC, therefore can be installed in any kind of vehicles, without the need to use additional external DC-DC converters. The device can be easily removed and saved to avoid eventual thefts or damages while the driver is out of the car. It is possible to lock and seal the device to the docking, making it unmovable. The customer can choose between 0, 2, 4 or 8 external free available COM Ports to connect directly several peripherals without using critical connections (such as Bluetooth connection). The secondary CPU is always working, even when Windows is powered off. The AITP Supply the necessary functionalities in the automotive field. Important feature that allows the device reboot in case of application crashes. Real Time Clock with calendar is provided. The OTA Client allows the update of the whole Operating System and all the CPUs Firmware. The OTA Server provides vehicles enrolling, group management and selective update, remote debugging and logging, with web based user interface. OFT (On Field Test) OnBoard Diagnostic Utilities included with Customizable CheckList (GPS Fix, GPS Antenna, GPRS Connectivity and Base Station Signal Quality, Odometer, Ignition, Panic Button, TouchScreen calibration, Hardware Keys, Ambient Light Sensor, Device version, OS Version, AITP Version, Taximeter, UPS and Battery Status, Roof Light, Navigation Software). These tests and enrolling features can be used during first installation and swap of devices. The audio channel selection (Windows line and mic or GSM phone) can be done programmatically through a dedicated API. GPS Receiver and GPRS wireless engine are built-in. Each peripheral (GPS, GPRS, Bluetooth, etc.) can be powered on and off programmatically through a dedicated API, in order to optimize the power consumption when the peripheral isn't necessary. Hardware MUX Port allows to send AT commands to the modem while the device is connected in GPRS, for example to request connection status, signal diagnostic and modem statistics, to send and receive SMS, to manage voice calls. Board to Board connector pin to pin compatible between GPRS (base), EDGE (option) and UMTS (option) retrofit upgradable. All the communication and tracking features are assured by the AITP processor even when the Device is powered OFF: the GPS and GPRS modules are managed by the AITP both for power supply and for communication. 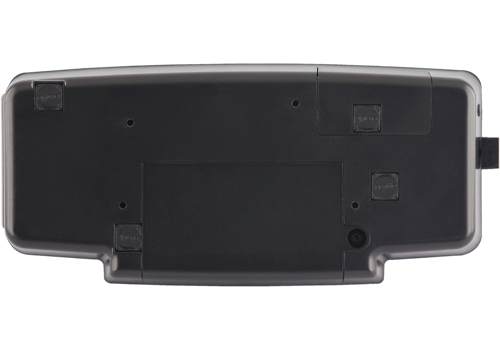 The GPS data can be delivered to two different Serial ports (for example one port used by the navigation software and the other by the logistic tracking application). There are two SIM card slots, a switcher allows to select programmatically the provider with the best signal. With this feature is possible to remotely turn-ON the device (also in stealth mode so nobody can see that it is starting) in order to check vehicle position, internal audio listening and other data. Stealth mode is a special operating mode in which the system is working but the display and audio are OFF (used for driver control and during alarm status). 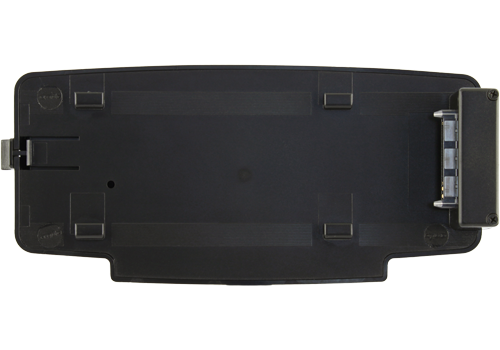 Allows to perform installation using external antennas, when the GPS and GPRS signal reception is difficult: for example to overcome the problems given by the modern vehicle shielded environment. Analog and Digital inputs available, filtered and protected against over voltages, that are usual in the automotive environment. 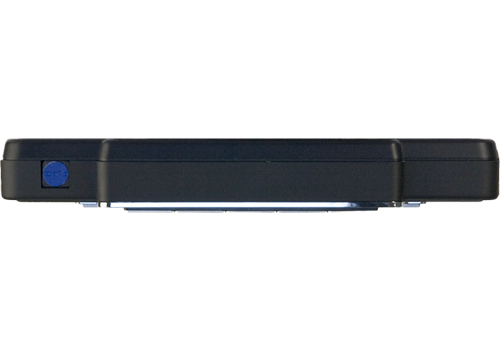 Power outputs available, filtered and protected against short circuits and over temperature. These are specially programmable digital inputs and outputs, that allow to perform high speed communication with external equipments. This feature allows to track the distance covered and the real time speed using an independent wheel pulse input. The Engine input can be used to automatically Power ON/OFF the system according to the Engine Key Status, this input is working even if Windows is OFF. The CAN interface can be connected to a standard CAN V2.0B at 1 Mb/s, application layers can be developed and customized at firmware level. This input can be directly connected to the Panic Button, and is working even if Windows is OFF (more, it works even if the Windows Device has been removed from the docking station). Samsung Primary CPU is 400MHz and the ARM architecture allows this Device to supply a remarkable flexibility and efficiency in computing power, together with reduced power consumption. Secondary CPU AITP (Automotive Intensive Task Processor) supplies the necessary functionalities in the automotive field, like power management, Safe Shutdown, Wheel Pulses Odometer, Distance and Speed calculation, Wake-Up on Ring, Over-the-Air services for software and firmware updates. 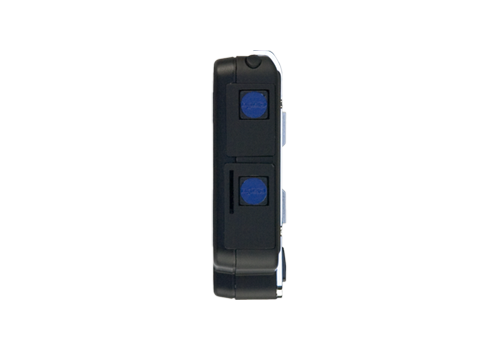 Its modem GPRS/EDGE (optionally also UMTS) allows very reliable communication with operating headquarters. The vehicle is located by the high performance GPS U-Blox 5 receiver with 50 channels, and compatible with the new European positioning system GALILEO. An Hardware MUX Port is available which allows to send AT commands to the modem while the device is connected in GPRS, for example to request connection status, signal diagnostic and modem statistics. The Docking Station is connected directly to the vehicle with all necessary cables: the device can be easily removed and saved to avoid eventual thefts or damages while the driver is out of the car: of course it is possible to lock and seal the device to the docking, making it unmovable. Display unit and docking station are hardware and software paired so each display unit works only with proper paired docking station. The 4.3 inches 16:9 clear readable TFT Displays with 480x272 resolution allow to develop versatile and high accessible applications, thanks also to the integrated TouchScreen controller, and to the 9 keys with LEDs available. Hardware Keys avoid consumption and damage of Touch Screen for heavily used operations. Can be also disabled or programmed to trigger Ghost Mode (fake shutdown). 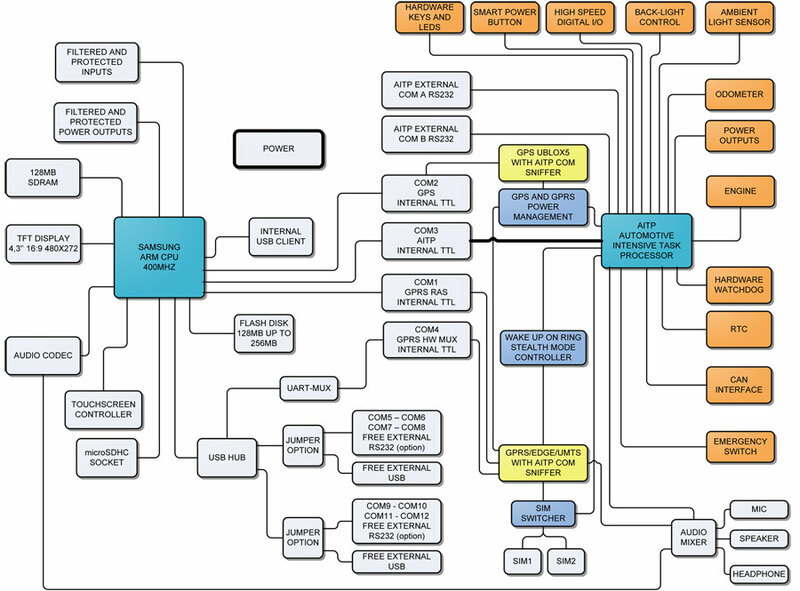 microSDHC for large data storage (large maps, images, movies, logs) and for service (system initialization or restore). The Device can withstand glitches at car start, or power loss problems thanks to the internal capacitors and to the minimum power voltage requested from the automotive CPU. An optional External USP Battery is available for 1 hour operation without main power and the AITP processor can gives time to user applications and Windows to close gracefully and safely in case of sudden disconnection of the Main Power. The Device supplies a wide range of communication channels with the external environment: two USB Host, one USB Device and up to 8 Serial Ports. 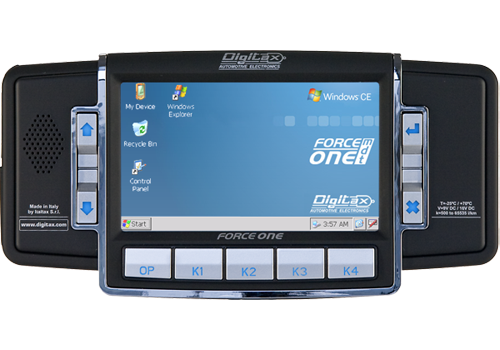 Microsoft Windows CE .NET Operative System and Compact Framework 3.5 combined with the complete Digitax Framework 4.1 allow the developers to create their applications and their services with the maximum simplicity and in very reduced time. A rich set of Sample Source Code is provided, along with extensive support from Digitax Automotive highly trained Staff. The Microsoft Windows CE .NET Operative System and the Compact Framework 3.5 combined with the APIs, SDK and the complete Digitax Framework 4.1 provided allow the developer to create their applications and their services with the maximum simplicity and in very reduced time. 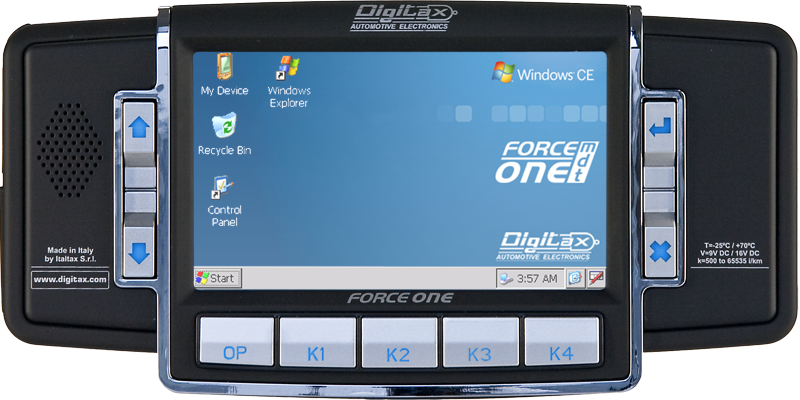 The Force One, with one USB Device for PC linking and debugging, provides a full development set of easy and powerful libraries that allows to avoid an advanced knowledge of programming languages. The Digitax Framework 4.1 then will perform the most difficult and critical operations providing smart and trasparent proprieties and methods to the developer that allow to develop stable and powerful applications and services. Select a component to view the details of the supplied functionalities. IPreShut IPreShut allows to check if windows is closing, so the application will have time to correctly close itself. Shutdown Allows to shut down Windows and the device. Shutdown and Restart Allows to shut down and restart Windows and the device. Alarm managing If system is off and alarm button is pressed the system can be started in stealth mode, so anyone could see that the system starts. On this special start the system can be programmed for example to send an alarm message to the central, GPS position or also screenshots or audio. Magnetic Card Reader To the device con be connected a 3 track magnetic card reader, it can be used for standard credit card or for company card. To interface the card reader it is given a simple software interface which allows to quickly interface it. 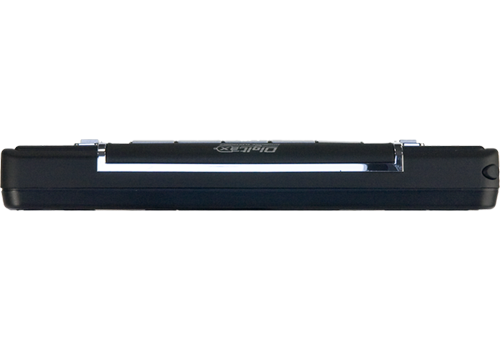 Dimmer Value Display dimmer value can be get and set to change display brightness. Dimmer Table Dimmer Table can be set get in order to adjust the automatic dimmer regulation, it is an eight byte array, each one is the dimmer value that the device will use on a specific light intensity value. 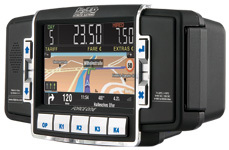 GPS Position This function allows to know the vehicle position (latitude and longitude). It's also return the status of the tracking (Fix = true or false). GPS Satellites This function allows to read all satellites informations. GPS Threshold Setting Gps receiver can be set in order to be more or less sensible to position changing, for example can be changed the PDOP fix threshold or the static threshold which makes the receiver not to change the output position if speed is under a certain threshold. GPS Hardware Antenna monitor GPS receiver gives also some specific information about its status like antenna disconnection or if there is a short circuit. IMEI It permits to read the Modem IMEI (International Mobile Equipment Identifier). IMSI It permits to read the IMSI from the SIM inserted in the modem. Signal It permits to read the signal power. SIM Check It permits to check if the SIM is present in the modem. SIM ID It permits to read the SIM CARD ID (SCID). Network Registration It permits to obtain the actual registration status to the phone network. Network Provider and Cell name It permits to obtain the network provider name and the cell name actually used. Available Network Protocol It permits to obtain the data protocol actually available to the network. Modem Temperature Status It permits to obtain the status of the Modem temperature and know if it's in alarm status. Phone cells informations It permits to obtain phone cell informations of the actually connected cell and informations of the adjacent cells. Modem Power On/Power Off It permits to power on and power off the hardware modem. Send/Receive SMS It permits to send and receive short text messages. Answer/Deny vocal calls It permits to know when a vocal call is coming and permits to answer or refuse it. PIN It permits to assign to the library the PIN to use with the SIM without a permanent block. The SIM will ask the PIN when the modem will be power off or the SIM will be disconnected from the modem. PIN Request If the PIN isn't known is available an event to ask it to the user. RAS connections enumerations It permits to obtain the list of the configured RAS connections in the system. Open/Close a connection It permits to open and close a RAS connection; an event will notify all connection status changes. Connection statistics permits to obtaining the system statistics of the RAS connection. Keep RAS connection working it permits to keep the RAS connection always active in base also of the phone network informations obtained from the Modem Manager. Get Odometer Data Odometer data like speed, distance, pulses, etc., can be asked or can be set an automatic trigger that sends them. Over-speed Warning The device can be programmed in order to raise an event if the vehicles goes over a selected speed. Odometer Auto Calibration Combining odometer and GPS data it is possible to auto calibrate the vehicle odometric constant. Driver should move for about one or two Km over a speed threshold (typically 50 km/h) without turns. After that GPS distance and odometer pulses are used to evaluate the correct constant. Odometer Connection Status GPS and odometer data can be used to check if odometer is connecting (typically GPS moves over a certain speed and there are no pulses from the odometer), also can be checked if there are problems on the odometer like presence of pulses when the car is not moving. Stealth Mode Stealth mode is a special operating mode in which the system is working but the display is off. This feature can be useful in several situations. Driver Control System has also the wake up on ring feature, so on the central it is possible to remotely turn on the device (also in stealth mode so anyone could see that it is starting) in order to check vehicle position and other data. Ghost Mode It is possible to set the device that after have been pressed the shut down button the system instead of turning of goes on stealth mode. This feature is useful if you want that the device will remain always on (it turns off only the display reducing power consumption) or in an alarm situation: if the robber forces the driver to shut down the device, it , instead of shutting down, can go in ghost mode continuing to send data to the central. Watchdog init and restart Watchdog feature makes the system to autorestart if the application blocks. Backup Performs a back up of the complete system, including Registry settings, new installed drivers and user applications. Creates an identical clone of the entire system in a single SD. Restore By creating a Backup SD, it is possible to restore, clone and update devices. Useful for production: once the system implementation is ready, create a Backup SD and Restore each device. Useful for upgrading: send the content of the SD over wireless connection to completely Restore a remote device. Logging It permits to write textual logs or binary logs. Live trace It's possible to enable the live trace for each log manager to obtain real time log string. OTA Client Professional OTA (Over The Air) Client allows the update of the whole Operating System user's applications and settings, system registry and all the CPUs Firmware. OTA Server Professional OTA (Over The Air) Server provides vehicles enrolling, group management, selective update, remote debugging and logging. Web based user interface included. Splash Screen Customization It permits to create an automatic microSD to logo configuration that permits to change the Splash Screen with a customized image or logo at the next reboot. 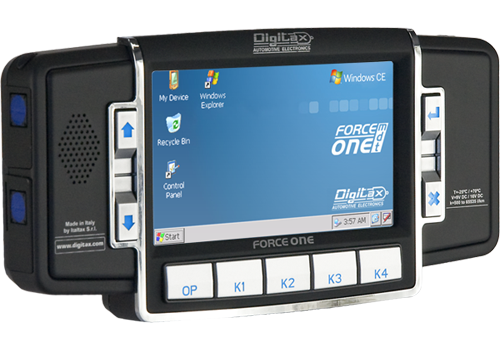 The ForceOne MDT is also optimized to use the Sygic Navigation Software, an advanced and powerful SDK/API is provided to use all functionality of this Navigation Solution. 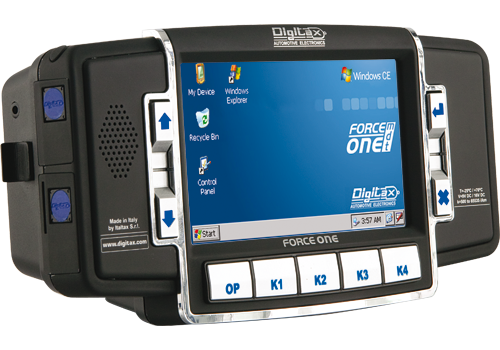 Full Automotive Rugged Touchscreen with configurable touch areas. Humidity Humidity up to 95% non-condensing. Vibration Vibration Sine wave, 10 ~ 500 ~ 10Hz, 1.5G, 0.37oct/min 3 axis, 1hour/axis.